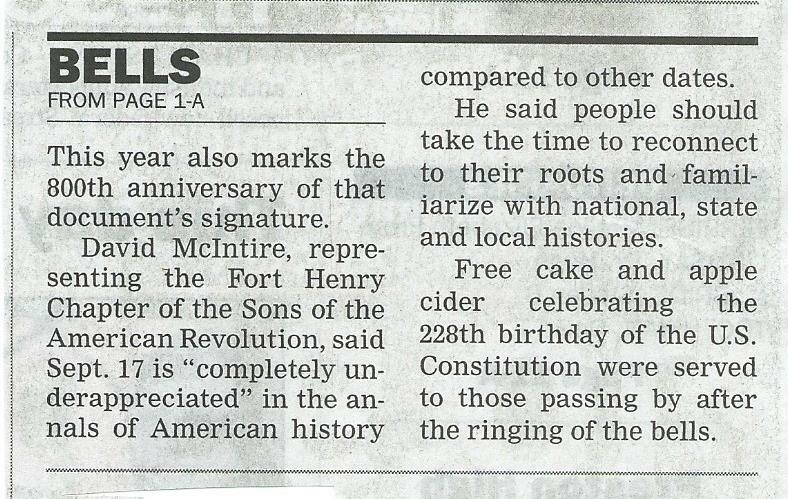 WTRF) – One local city park was honored by the Fort Henry Chapter of the Sons of the American Revolution. 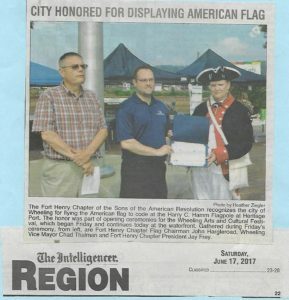 The City of Benwood received a Flag Commendation for its highly visible display of the flag at the city park. 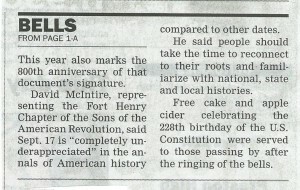 The flag was dedicated in November of 2017. 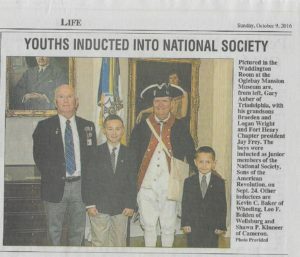 The Sons of the American Revolution give this honor every year to those who follow the U.S. Flag Code. 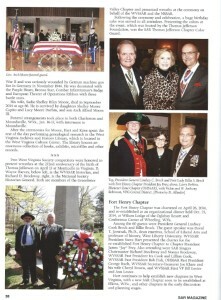 The code outlines the customs and rules that govern the display of the flag. 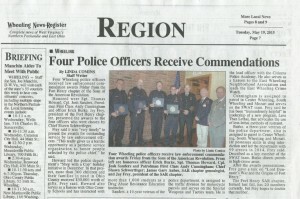 Benwood Mayor Ed Kuca and Police Chief Frank Longwell accepted the award on behalf of the city. 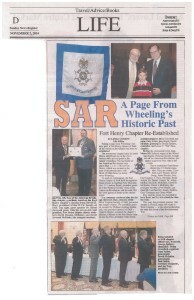 “We are delighted to have such a flag. 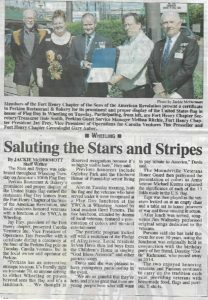 Our community has always been patriotic. 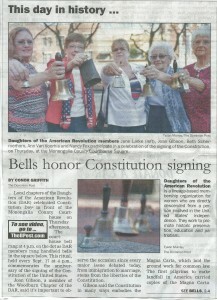 This is a symbol of our appreciation of the men and women that gave us the right to do this,” said Longwell. 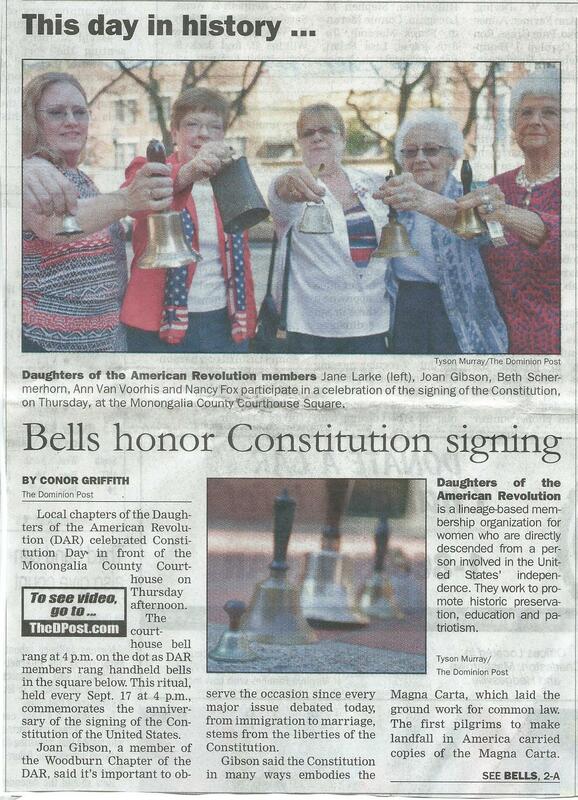 “It’s a symbol to honor our military and our freedom. I’m just so happy that the city received this award,” said Ed Kuca. 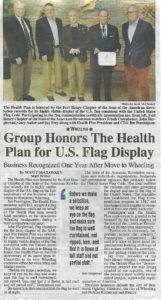 “This flag was installed in November and we thought it’s a new flag, but they have done a great job and it should be recognized,” said John Hargleroad with the Sons of the American Revolution Flag Committee. 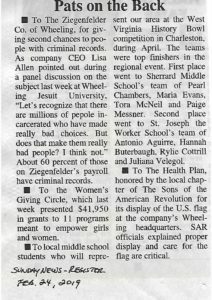 Previous winners include Oglebay, Elmhurst, the City of Wheeling, and Perkins Restaurant and Bakery. 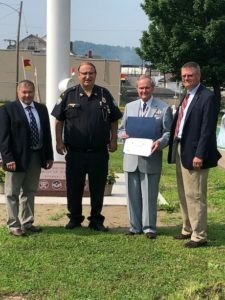 L to R: Benwood mayor Edward Kuca, police chief Frank Longwood, Jay Frey and John Hargelroad, June 18, 2018. 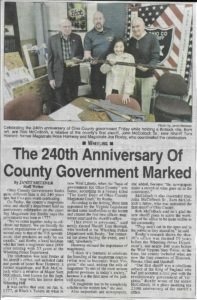 Chapter member Bob McColloch (far left) helps Ohio Co. Government observe its 240th Anniversary. Bob’s patriot ancestor John McColloch was the first high sheriff of Ohio County. 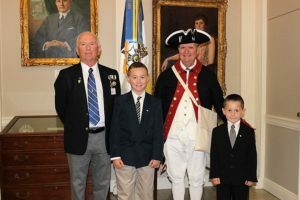 (l to r) Chapter genealogist Gary Auber, his grandson Braedon Wright, chapter president Jay Frey and Logan Wright. 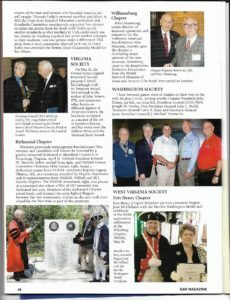 The Chapter’s recognition of Regent Joan M. McClelland was reported in the Summer 2016 issue of the SAR Magazine. Chapter Flag Chairman John A. Hargleroad, III arranged a Flag Commendation presentation to Perkins Restaurant and Bakery, 680 National Road, in Wheeling on June 14 in observance of Flag Day 2016. 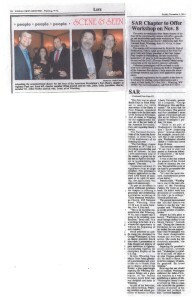 The presentation was covered on WTOV9 as well as on WTRF-TV (see video clip belowin the Wheeling News-Register. 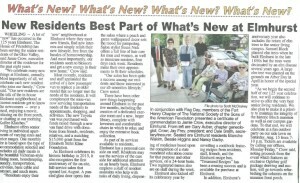 Click on the WTOV hot link to view the video. 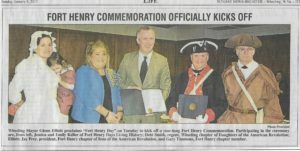 In observance of Flag Day the Fort Henry Chapter presented a Flag Commendation to Elmhurst, The House of Friendship for exemplary display of the national standard. 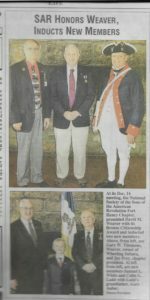 Pictured at the ceremony on June 12, 2015 are chapter genealogist Gary Auber, Elmhurst executive director Jamie Crow, secretary-treasurer Dale Smith and president Jay Frey. 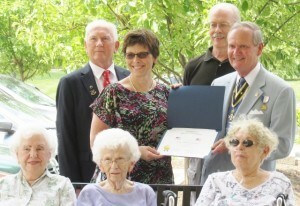 Seated in the foreground are Elmhurst residents Blanche Wakim, Bessie Higgins and Nancy Darby. 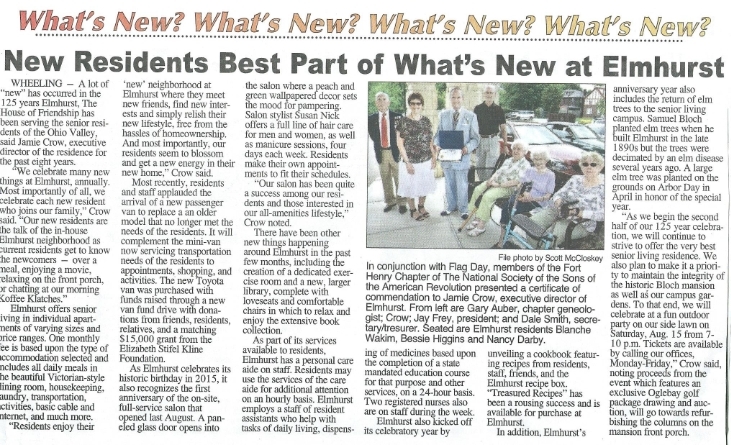 Elmhurst, one of West Virginia’s premiere assisted living facilities, is celebrating 125 years of service in 2015. 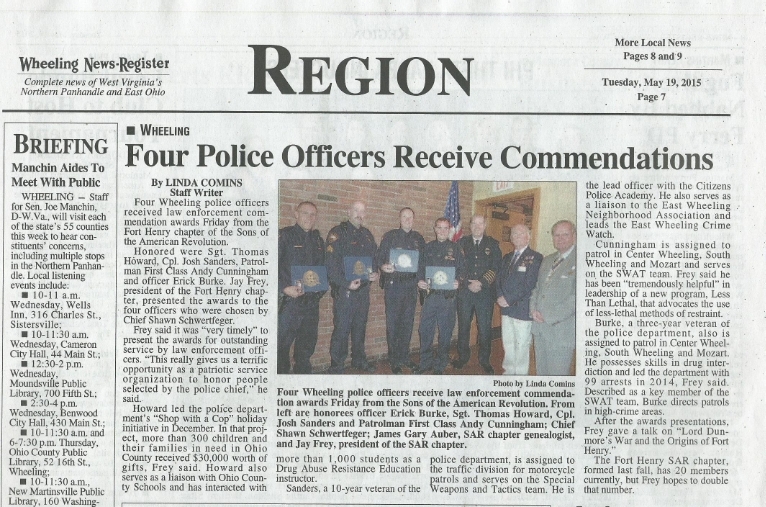 At its May 15, 2015 meeting the Fort Henry Chapter presented four Wheeling Police officers with Law Enforcement Commendations.